Teens fill backpacks for recent refugees. A key objective of Rose Community Foundation’s Jewish Life program area is to support meaningful ways for Jewish people and their families in the Greater Denver community to connect with the Jewish community at pivotal stages in their lives. Specifically, the Foundation supports innovation and new ways to connect Jewish people to Jewish life and to each other. One of the tools the Foundation uses to ensure it is supporting effective programs and innovation is good research. Research provides sound information about Jewish people, what types of Jewish experiences are meaningful to them and the best ways to reach and connect them to those experiences. The Foundation collaborates with other funding partners in many of these efforts to produce high-quality, broad-based studies with clear practical directions for programming. You can see many of the studies that guide the work of the Jewish Life program area here. Recently, the Jewish Teen Education and Engagement Funder Collaborative, of which Rose Community Foundation is a member, undertook a significant effort to measure the effectiveness of programs that engage and educate teens. Generation Now: Understanding and Engaging Jewish Teens Today, a report from The Jewish Education Project, was released last spring. The report includes 14 outcomes to help measure the impact of Jewish teen education and engagement efforts, along with deep insights about Jewish teens gleaned from years of research, surveys and focus groups with teens (some of which were conducted here in Denver). Generation Now introduces a new paradigm for approaching teen education and engagement — thinking about the whole teen and all aspects of her or his life. Teens hold welcome cards for refugees. These 14 outcomes will inform the kinds of projects the Jewish Life program area will consider going forward. 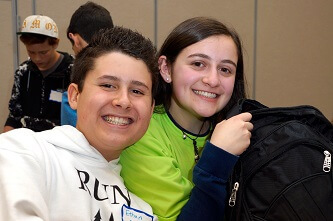 Currently, Rose Community Foundation is in year two of a four-year Jewish Teen Education and Engagement Initiative funded collaboratively with Jim Joseph Foundation and over 30 other generous donors. Denver and Boulder are testing some of the outcomes outlined in the GenerationNow report out in the field, and so is one of the communities helping the Jewish Education Project discern whether programs are achieving the outcomes in the report. This multi-faceted initiative draws from a variety of best practices, proven models of engagement, and new ideas to offer teens an array of Jewish education and engagement opportunities.